B&H has put together this ORANGEMONKIE Foldio2 15" Mini Studio with 360-Degree Turntable Kit to give photographers and videographers everything they'll need to produce compelling 360-degree images with their DSLR or smartphone. The kit includes a white 15 x 15 x 15" enclosure with two daylight-balanced LED strips that fold down together into a form factor that's only 1/2" thick. White, Gray, Black, and Green backdrops are provided for complementing color options. The included 360-degree turntable has LEDs built into the base to eliminate the horizon line, lending your subject the illusion of floating. 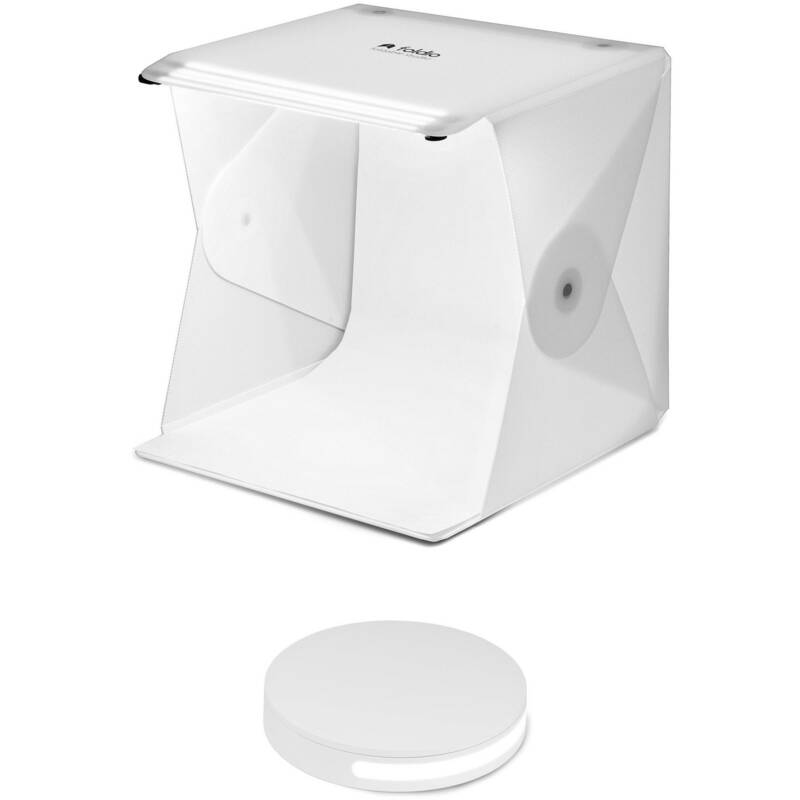 Ideally combined with the optional Foldio2 Mini Studio or similar setup, the Foldio360 Smart Turntable from Orangemonkey allows you to quickly and easily capture 360-degree images with your smartphone or DSLR. The white turntable employs a unique Halo Edge Light System that uses LEDs built into its base that are designed to eliminate the line or horizon created when using a backdrop. An automatic shooting system uses Bluetooth and IR sensors to connect directly to your smartphone or camera. Clicking a button on the turntable's Foldio360 app starts a process that takes photos from all sides of your subject and combines them into one 360-degree image for web sharing or ecommerce. The Foldio360 uses Bluetooth and IR sensors to connect directly with your smartphone and DSLR camera. Once you click the start button, it will automatically rotate, take photos, and combine them to create one final 360 image. Foldio360 has a unique feature called Halo Edge Light System to further enhance the quality of your 360° images. This helps eliminate any boundary lines to create high quality 360 photos. The Foldio360 photography tool is an intuitive, easy-to-use system. All of its processes only take only a few minutes. Upload and share your photos to your blog, online store, and other websites to show off your 360-degree images. Create a unique, attention-grabbing 3D page using your 360° images. Box Dimensions (LxWxH) 14.8 x 11.55 x 3.5"